Last week, we gave you an early listen off blues legend Taj Mahal‘s newest album Labor of Love (Acoustic Sounds) in the form of a delightful “Shortnin’ Bread” that paired Mahal with the late one-armed harmonica player Neal Pattman, a song that’s described by Music Maker Relief Foundation founder Tim Duffy in the album’s liner notes as “as good as anything that was on wax in the 20s and 30s”. The rest of the dozen tracks that appear on Labor of Love, out today, are every bit as respectable and genuine, including six of Taj on his own and six more with other Music Maker artists such as John Dee Holeman, Algia Mae Hinton, Cool John Ferguson, Etta Baker, and Cootie Stark. Among the former are such favorites as the opening “Stagger Lee” on which Mahal’s gruff, sometimes growling, vocals, airy guitar, and effects like guitar plunks to simulate the bullets that shot Billy down help to create one of the sweetest versions of the murder ballad you’ll hear; the quiet, swaying “My Creole Belle” (Mississippi John Hurt) that includes such breezy lyrics as “got a house in the country, big garden out back, Robert Johnson on the victrola, tell me what ya’ think of that”; the delightfully bouncy “Fishin’ Blues”; the beautiful guitar instrumental “Zanzibar”; the soft, slow blues of a “Spike Drivers Blues” (another from Mississippi John Hurt) that flows back and forth between harmonious observations like “Don’t the light from the moon outshine the sun, sometimes?” and an almost spoken tale relating an escape from a railworking gang; and a plodding, scratchy-voiced take on the classic “Walkin’ Blues” that, despite the song’s slowed tempo, often has Mahal fitting in words like an auctioneer. Mahal switches to the role of instrumental sideman for the remainder of the tracks, providing barrelhouse piano to John Dee Holeman‘s guitar and vocals on “Mistreated Blues”, wailing harmonica to blind Piedmont bluesman Cootie Stark‘s guitar and vocals on “So Sweet”, and some good old-fashioned body-slapping to accompany Holeman’s old-fashioned rapping and hambone playing on “Hambone”. He also contributes on upright bass on both the soothing, Algia Mae Hinton-sung “I Ain’t the One You Love” and on the jazzy, flowing “Song for Brenda” with guitarist Cool John Ferguson, one of a pair of nice instrumentals that close out the album, along with a magical, creaking “John Henry” with the late, great Etta Baker on which Taj plays slide guitar. A diverse line-up of guests, combined with Mahal’s frequent, carefree changes of direction on both instruments and vocals – including occasional spoken interjections – help make for a charming, entertaining listen. With its focus on this traditional, sometimes raw, Southern music, Labor of Love is just the kind of record that’s perfect for vinyl (and that only makes us even more eager to hear Mahal’s collaboration with Keb’ Mo’ coming up in 2017). 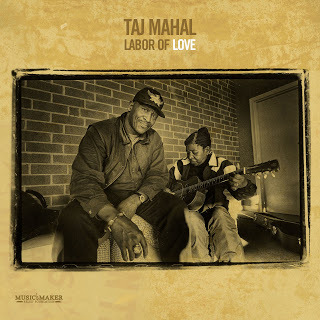 If Mahal’s service on the Music Maker Relief Foundation’s advisory board wasn’t evidence enough of his commitment to helping to preserve this important musical art form, this stripped-down collection shows that, for Taj, the music remains a real labor of love. This entry was posted in Albums and tagged Algia Mae Hinton, Cool John Ferguson, Cootie Stark, Etta Baker, John Dee Holeman, Music Maker Relief Foundation, Neal Pattman, Taj Mahal. Bookmark the permalink.